We feel the love in your e-mail and we especially felt it at the ashram. We firmly believe that you feel the essence of the person that prepared your food; that's why we seldom eat out. You are a very special person and we are happy to have had such a close interaction with you. We can't remember when we've had so much fun preparing meals. 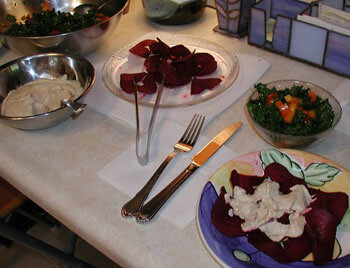 Attached is a picture of our beet alfredo and kale salad meal. ... We've been experimenting more and more and loving every minute of it. Since that weekend, Patty and Denny have become even healthier than they already were. They jumped right into preparing gourmet raw foods, purchasing raw food recipe books as well as the various equipment that is helpful when living a raw food lifestyle. I'm always happy to see an email from them, hearing what they've been doing recently and seeing pictures of some raw foods they've been creating. 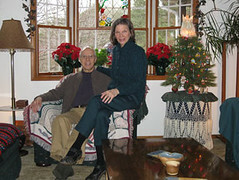 Recently, Patty and Denny prepared the raw potato pancakes and raw ice cream cake recipes that were sent out to our subscribers. 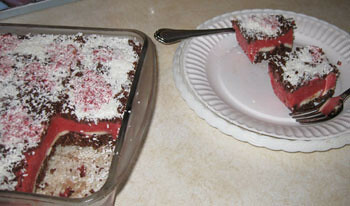 Below are some pictures of the food, as well as what they had to say about the potato pancakes. 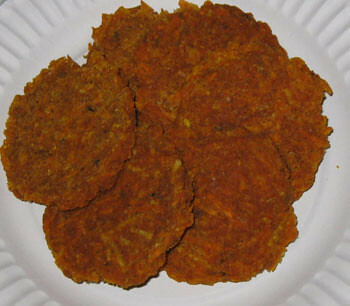 We finally tried your recipe for the Sweet Potato Pancakes and we're completely awestruck at how wonderful they taste and how great the recipe worked out - you've definitely found your true niche, the raw world is fortunate to have your valuable input. We used Kirkland's Organic No-salt Seasoning since Patty isn't crazy about garlic, and we didn't have the asafoetida, and it worked out great. We enjoy hearing from our blog readers (we consider you our friends, too!). It makes the effort we put into helping others very much worth it! Just having met Patty and Denny and hearing from them about how much I have changed their lives was enough to make my mission to spread the word about raw very rewarding! The more of us who learn about the vitality that comes with living a raw food lifestyle, the more we'll be able to share that information with others. Someday the knowledge of the health and vitality that is waiting for every single person through raw foods is going to be easily available to everyone! What a beautiful future we have ahead of us! Thanks for visiting our blog, for sharing your stories with us, and for reaching out through your blog comments and email. It means a lot to us. Thanks for the update on Patty and Denny! I'm going over to their blog right now. Uh-oh, we're famous now! Thanks for the kind words. The raw community is full of so many very nice people; everyone is so loving. Thanks Wendi, Jim, KDcat, and Melissa and Dave and Ella for being our inspiration. Thanks for your comment, Becky! It's nice to "see" you here. Can't wait to get started on them! (saves us from manually sending it out to each person individually). I'm sure you're going to love the recipes!! posted. It was the day you were with Kevin in the video. why you didn't receive the susequent emails from us. first email with the eBooks. Thanks for your patience as we figure this out. I also haven't received the subsequent emails :( I wonder if there's something wrong with the auto-mailer? Rosey did. If you did, that may help us figure this out sooner. I looked up your subscription. According to the records, you should either have received the Potato Pancake recipe email already, or it'll be coming within a day. The system we use sends them out in a particular order, so I think you'll get that email very soon. If not, just drop us a comment and we'll get it to you asap. I'm looking forward to hearing about your experience with the recipe!! I have two questions about the recipe I was wondering if I could ask you. Is there an email address I can send them to?